Something I have learned over the years is that my own experience coupled with the anecdotal experience of my peers will always trump the theoretical. Most assuredly, this also applies to coping skills learned in a disaster or what I like to call a “Disruptive Event”. Some of you might recall that due to a break at the water meter coming into my home, I was without running water for 12 days. Because I was prepared, the lack of running water was at most an inconvenience. You might even say that it was a grand adventure as I experienced a real life test of both my water preps and coping skills. Today I have another real-life experience to share. This time, Daisy Luther, the author of The Prepper’s Water Survival Guide, shares a chapter from her book that describers her own first hand experience living life without running water during a power outage. Talk about a double whammy: no water AND no power! Included in this chapter are are seven solutions to help you survive for the short term when the tap is running dry and the pump to the well (if you have one) is no longer working. 3.2 Shop Emergency Essentials Sales for Fantastic Deals! I had been a prepper for several years before the importance of water storage truly resonated. As with most lessons, I had to learn it the hard way (fortunately, for us, it was not quite as hard a lesson as those in Chapter One). My youngest daughter and I spent a year living in a cabin in the woods in North Central Ontario. We lived in secluded splendor on the banks of a huge lake and on the edge of an enormous national forest. We moved there straight from the city, so our “initiations” were many. In this breathtaking setting, we learned to provide our own heat and live without electricity and running water. You know how it goes with the most important things you learn: we were thrown right into it and the choices were to either sink (by packing up our belongings and scurrying back to the city with our tails between our legs) or swim (by learning what we needed to in order to thrive in this drastically different environment). The little cabin we moved to had electricity and running water supplied by a well 30 feet from our back door. Don’t let these amenities fool you, though. Just because these things were present doesn’t mean they were always available for our use. Try getting a heavy concrete well lid off when it’s buried under 3 feet of snow, then get back to me about the ease of availability of the water within. The first challenge came in the late fall when our well dropped to dizzyingly low levels. The drought that had been going on for years was not limited to the West Coast—even lush, green Ontario suffered from low water tables. Everything that came out of the taps was cloudy and murky, with bits of sediment from the bottom of the well floating through it. This was certainly not acceptable for drinking, washing dishes, or cooking. We had a bit of water, but not enough to do a load of laundry, and even if we had enough, our clothes were unlikely to get very clean from that muddy-looking water. This broke us in gently, since we could still flush and take a quick, if not particularly thorough, shower. This predicament inspired me to invest in a water dispenser for the kitchen and enough 5-gallon jugs to keep us supplied with drinking water for a month. We used this for drinking, cooking, and making ice. Kitchen sanitation was difficult and with snow impending that would leave us stranded at the cabin, I was hesitant to use our newly acquired drinking water for cleaning purposes. Here are some of the solutions we came up with. We dirtied as few dishes as possible. I cooked in the oven and lined the cast iron with tin foil, which could easily be dis- posed of. Then the cookware required only a quick wipe. We also ate from paper plates and used the same drinking glasses throughout the day. I set up a reusable water filtration system for dishwashing. I didn’t want to use my good Berkey filters for all of this sediment and gunk, so I rigged up a device for my faucet. I used a mesh sieve lined with a piece of fabric. (Flour sack towels work well for this, as do coffee filters for a disposable option.) I tied this little contraption to my faucet with a piece of garden twine and ran water through it slowly. It caught the greater part of the sediment. I put a splash of bleach and dish soap into the water. For rinsing, I used lake water that had been filtered through the Berkey, boiled, then seasoned with a little splash of bleach. We cleaned with kitchen wipes. For wiping down counters, stoves, and food prep areas, we used antibacterial kitchen wipes. It seemed really silly to “clean” with dirty water. If it wasn’t too dirty from the dishes, we used the dishwater for cleaning, too. The issue with our well lasted for about three weeks before the rain began to fall. Water table levels rose, and with them, our well water levels. Soon the water was sweet and clear again and we felt we were over the hurdle of water shortages. Little did we realize that all of this was merely a warm-up for the big event that would soon be coming our way. It would give a whole new meaning to power outages. We hadn’t been there long when we had our first power outage. Being straight off the bus from the city, I thought that with a well and septic system, life would be easy in a situation without electricity. I was prepared for life without lights, appliances, or the Internet. But what I hadn’t thought of was life without running water. Not even dirty running water. No. Water. At. All. In the city, despite our other inconveniences, when the lights went out, the water still flowed from the taps and the toilets still flushed. Not so when you have a well run by an electric pump. I discovered this when I got a panicked cry from the bathroom. “Moooooom! The toilet won’t flush!” Rosie called. Rosie turned the taps to no avail. Uh oh. Then it dawned on me. The pump. I sent my daughter down to the lake with a bucket to get water for flushing. We left the lid off the tank throughout the lights-out episode for the sake of ease. Life without clean running water posed some problems, but it was nothing compared to life with NO running water at all. We rallied quickly. We had our 5-gallon jugs of drinking and cooking water. The lake had not yet frozen over, so we were able to haul up buckets of water for our other needs. But I was determined not to be stuck in this position later, when a foot of ice would cover the water of the lake. I took notes throughout the outage, which was mercifully short, and came up with solutions to ease future electrical out- ages and their subsequent effects on water. More details on the nuts and bolts of water storage methods follow in Chapter Six. Store tap water for sanitation. We added to our water storage supplies by purchasing 1-gallon bottles of drinking water. After we consumed the drinking water from these, we refilled them with tap water. Many of these were stored near the bathroom. Fill the bathtub as soon as the weather gets bad. Because we lost power frequently, we began to immediately fill the tub the second the sky darkened and the wind began to howl. A full bathtub can provide a lot of flushes and washing-up water. Place an old-fashioned pitcher and bowl on a stand to use for hand-washing. For many solutions, you need only look as far as an antique shop to see what our ancestors did. We set up cups near the pitcher and bowl to use for brushing our teeth. Order extra filters and parts for your water- filtration system. Living in such a secluded area, the snow removal was not always dependable. With the filtration system, we never had to risk running out of potable water. Use basins for dishwashing. Instead of using the sink to wash our dishes, we used basins. This way the water could be reused for flushing after the dishes were washed. Stock up on baby wipes. When the power is out, you still want to keep clean. Baby wipes are a good way to take a quick sponge bath without using freezing cold water or using up your precious supplies. They can also be used for hand-washing and minor cleanups. Keep a kettle on the woodstove. Actually, keep a couple of them. This added moisture to the dry air in the cabin and had the benefit of hot water on demand for tea, cocoa, or for adding to the basin to wash up with. By the time the next power outage rolled around, we had become pros, and it was barely a blip on our radar. The real moral of this chapter is not what we did or how we did it, though. It is that you can’t know what difficulties you will face without a practice run. We’re pretty good at living without running water now, because we have had a lot of practice. It’s less convenient but it hardly feels like “roughing it” because we learned to resolve our issues. We discovered what we needed to make our lives more comfortable and we were able to stock up on those things at our leisure. Trust me, you don’t want to discover you need something only to find that everyone else in your town has just discovered the same thing. The “Rule of Three” states that you can survive three minutes without air, three days without water, and three weeks without food. That said, for most of us, the practical concern following a disaster will be water, plain and simple. I totally agree and because of that, I am promoting the sharing of as much free information as I can to help you plan ahead for both long and short term catastrophes that may impact you water supply. Having said that, if you have a few extra dollars to spare, I encourage you to check out the book, The Prepper’s Water Survival Guide: Harvest, Treat, and Store Your Most Vital Resource . Other than your book on Survival Medicine, it may become the most important book in your library. It was late July when I first conceived of “Water Month” on Backdoor Survival. At the time, I failed to consider the calendar and how it would be impossible to cram everything I wanted to do into a single month. As a result, you are going to find that “Water Month” may actually spill over into September. Answers to the questions you asked in the Prepper Book Festival giveaway, a round-up of some of the best water-related articles on the web, and finally, a fantastic review and giveaway for a an off-grid water purification system. All free, all for you. Whew! I don’t know about you but I am enjoying having a “theme” month. So much so I may just do it again. Food Storage anyone? Bargain Bin: Below you will find links to some of my own water preps, all of which are related to today’s article. LifeStraw Personal Water Filter: The LifeStraw contains no chemicals, no batteries and no moving parts to wear out. It features a a high flow rate and weighs only 2 oz. It works quickly, taking roughly 3-5 seconds of sucking to start the flow of water through the filter. It’s ultra-light and inexpensive but effective. 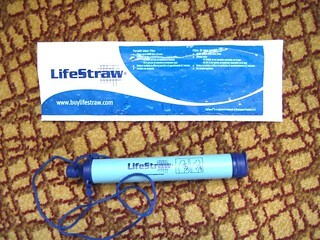 There is also the LifeStraw Family that will purify up to 12 liters per hour. Here is a link to my review: Clean, Drinkable Water – LifeStraw Family Review. The Prepper’s Water Survival Guide: You can survive up to three weeks without food, but only three days without water! This book will teach you how to store fresh water, collect rainwater, purify water from lakes and rivers, dig a well for groundwater and more. Highly recommended. Berkey Water Filter System: My own Royal Berkey and it represents a key component of my water preps. This is definitely something you want to save up for. No Rinse Cleansing & Deodorizing Bathing Wipes: One wipe is more than enough for a complete “bath”. These are a good backup when traditional showers are not available such as the week or weeks following a disaster. Here is my review. Amazon Elements Baby Wipes: I personally have excellent results with Amazon-branded products and am pleased to see they are now offering baby wipes. Ultimate 55 Gallon Water Barrel Combo: As of this writing, $99.95 which is a great deal. Everyone should have at least one. Remember, if storing in your garage or on pavers, place the filled barrel on a wooden platform and not directly on the concrete. NALGENE BPA-Free Water Bottle: These $8 water bottles have served me well. I fill them up with water from my Royal Berkey and keep one bedside, one at my desk and another in the bathroom. Keep in mind that price-wise, some colors will be more expensive so if color does not matter, go with the cheapest (currently the green version). Thanks for the introduction and information. This is one of my concerns where I live. I know that water will be a challenge. Maybe I’ll find a million dollars and can max this easier!!! Thanks Gaye! I lived in Johnstown, PA during the ’77 flood. Not having water was a nightmare. I had a 9 month old and was pregnant as well. No electricity, no water, no nothing!! If it weren’t for my father-in-law who had a farm 50 miles away, we’d had been in deep do-do. He brought milk cans full of water, a pickup truck full, formula, lanterns and just about everything you’d need to ride it out. He even got past the national guard to get into the city. We rode it out better than most. Afterward I realized farmers are prepared for most any emergency and so my mindset began to change and realized real emergencies happen in a blink of an eye. Be prepared for anything and then fear nothing! One additional container for storing water. Your top-loading washing machine. In an emergency, it sure can help. One small water saving tip on flushing toilets. You can dump one gallon directly into the toilet where it takes about 2 1/2 gallons in the tank. We use this method when we shut off the water for the winter at our camp. Thanks for the info. I have never been without water for more than a couple of days in my lifetime. Luckily we store enough water. Something I learned at an early age. I’ve lived without running water in Alaska for more than 5 years…you can do it. I lived on a farm in Australia rain tanks. That’s the way to go. Now I live in Oregon and most everyone seems to be on well or city water. ItIt also seems like peppers should live off grid permanently. That way when the end comes they are already set up. I’m a fan of having a hand pump as a backup for your electric well pump. Some models can pump well water from a well with a static head of 350′ deep. Also, a well house surrounding your well keeps snow and ice off and makes for more comfortable hand pumping in inclement weather. But above all, store LOTS of water. You can never have enough. And your Berkey (as well as my AquaRain 400) can filter raw sewage so that it’s safe to drink, much less lake, pond, or river water. Don’t know about your Berkey but the AquaRain filters are cleanable/reuseable 200 times.